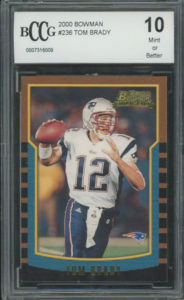 For those of us that had the forethought to grab Tom Brady rookie cards in 2000, we should pat ourselves on the back. For those of us just getting around to buying Tom Brady rookie cards, we should also pat ourselves on the back. Tom Brady has become as much of a household name as Michael Jordan or Mickey Mantle. He has proven to be one of the sports greatest quarterbacks and as such, his rookie cards are highly collectible. As I write this, Tom Brady has amassed the following: 5x Super Bowl, 12x Pro Bowl, 2x All-Pro, and 2x MVP making him one of the most successful players in football history.1)Tom Brady. www.pro-football-reference.com As a result, his football cards have become some of the most collected in all of the hobby. This particular example was graded by BCCG, Beckett's more lenient grading arm. For those of us who want to keep both our arms and legs but still possess a high grade Tom Brady 2000 Bowman rookie, this is an excellent alternative. This item has been graded by BCCG and is offered by Pristine Auction. Click here to see the listing. This card hails from a memorable commemorative set from the late 1980s. 1987 Hygrade Baseball's All-Time Greats baseball cards were available in set form and featured an impressive roster of baseball players that helped shape the games prominence and overall popularity. It's not surprising to see Snider as part of the set. These cards were released not bearing a signature, however, so signed examples present significantly more prestige. This particular card features a classfully aged signature and is hand numbered to just 100 signed examples. 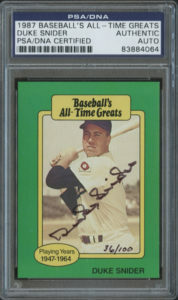 For those of you looking to add another Hall of Fame autograph, consider adding this signed 1987 Hygrade Baseball's All-Time Greats Duke Snider. For a lot of us, this is another one of those times when we may have wished we prospected in 2007. Kevin Durant rookie cards have become ever popular as his career statistics continue to impress. As I write this, he's already collected the following: 8x All-Star, 7x All-NBA, 2007-08 All-Rookie and ROY, 2011-12 AS MVP, and 2013-14 MVP.3)Kevin Durant. www.basketball-reference.com For a player who's only been playing for 9 years and isn't even 30 years old yet, that's one heck of an impressive resume. Alongside Bowman Chrome, Topps Chrome has been one of the key releases for rookie cards. 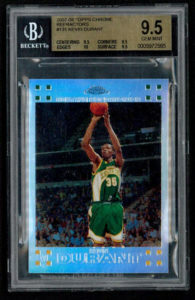 The 2007-08 Topps Chrome Kevin Durant rookie card has grown in popularity and continues to drive big returns for sellers. Its rare parallels are becoming ultra scarce and equally desirable. With only 1499 copies printed, the refractor parallel has become a hot commodity with collectors. If you're looking to add a key piece to your collection, this may be the addition you've been after. This item has been graded by BGS and is offered by Pristine Auction. Click here to see the listing.